Bob is factory authorized to provide warranty service for all major brands of domestic refrigerators, freezers, and ice-makers, including freon removal. Bob provides same day service whenever possible, so he can fix your refrigerator today! Bob Bolen has been repairing all major brands of refrigerators, freezers, ice-makers, and wine coolers in Bozeman, Belgrade, Big Sky, Livingston, Ennis, Three Forks, and the Gallatin Valley for over 20 years, so he knows his way around the kitchen...and a refrigerator. Bob can fix just about any refrigerator. He's a certified technician of all brands of refrigerators, freezers, ice-makers, and wine coolers...so if it's supposed to stay cool, Bob will make it cool. Bob's Icebox Repair provides refrigeration repair services in Bozeman, Belgrade, Big Sky, Livingston, Ennis, Three Forks, and the Gallatin Valley area. Bob provides factory authorized warranty service for nearly every brand of refrigerator, freezer, ice-maker, and wine cooler on the market...and in many cases he can provide that service the same day you call. So if your refrigerator isn't running, call Bob and he will have it performing like a new refrigerator the same day. Bob stands by his work and proves it with a guarantee that will make you feel warm and cozy inside, while your refrigerator, freezer, ice-maker, and wine cooler stay ice cold. All work performed by Bob and all materials used in repair of any refrigeration unit are of first quality and guaranteed for a period of ninety (90) days after date of repair. This guarantee is printed on every work order and every receipt. Bob wants you to know he is confident in his service and that you should be confident, too. So if your refrigeration unit is still under warranty Bob can fix it and help with the paperwork! Save Money and the Planet by "Going Green"
Bob knows a broken refrigerator brings about a difficult decision - to repair or buy new - but if you think buying a new refrigerator is going to make your monthly energy bills decrease...you may want to talk to Bob. The refrigerator hasn't changed much in the past 30 years, and new refrigerators may boast better insulation, but generally your old refrigerator will consume about the same amount of energy as a new refrigerator. If you want to save money on energy, you may want to invest in a new washer or dryer, because a new refrigerator will only provide limited savings. Bob knows a good refrigerator when he sees one, so let him take a look and he can help with this difficult decision. Bob wants you to feel confident in your refrigerator's performance, and is dedicated to making sure you've made the right decision, whether it be to repair your old fridge or buy new. Of course, Bob wants to keep your refrigerator out of a landfill, but he also wants you to understand that sometimes repairing that refrigerator may not be worth the time and money. Bob would rather lose a sale than repair an old refrigerator that's only going to have more problems in a few months. So ask Bob's advice, and he will give it to you straight! 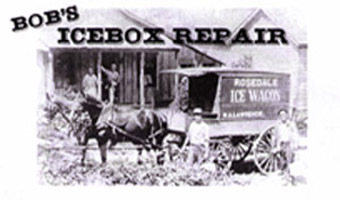 Copyright © 2010 Bob's Icebox Repair. All rights reserved.